Lakewood and Busti Residents may reserve the Lawson Park pavilion from May through September of each year to insure availability. Reservations are taken in advance for the following year, starting January 1st. Those organizations exempt from the fee are Southwestern Schools, Boy Scouts, Cub Scouts, Girl Scouts, Busti Golden Agers and 4-H. Tennis, volleyball and basketball courts, and a baseball field are all available at a first come, first served basis. Reserving the pavilion does not insure use of the courts and field. Pavilion is equipped with electric (switches are at the front and back) and a charcoal grill. Water is also available. Restroom facilities are not handicap accessible. Alcoholic beverages are not permitted at Lawson Park. The Edward F. Loomis, Jr. Park is located in the Town of Busti off New York Route 394 between Loomis Bay Road and Vukote Road. Franklin Loomis, (born 7/3/1826 – died 9/24/1892) purchased the land along Chautauqua Lake from 1855 to 1886 and originally used it as a dairy farm. The lakefront property became a fishing community. Later the property expanded into a summer cottage location by Edward F. Loomis, (born 1/13/1864 – died 8/24/1947) and Edward F. Loomis, Jr., (born 3/3/1913 – died 12/24/1992). 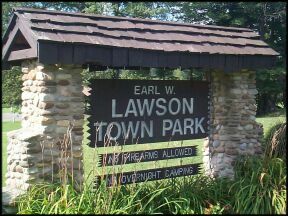 The park lands were donated to the Town of Busti by the Estate of Edward F. Loomis, Jr. in 1996. 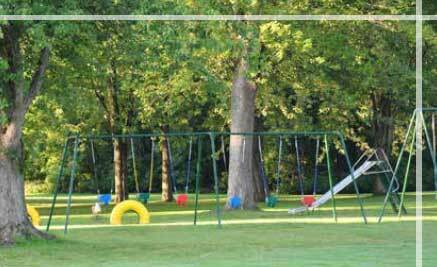 The Town of Busti’s significant improvements to the park include an open pavilion, (a concession stand, restrooms – spring 2017), four soccer fields, tennis courts, a volleyball court, a children’s playground and two basketball courts. There is ample parking for those using and enjoying the facilities. In 1999, the land north and west of the park became the Loomis Bay Subdivision covering 140 lots along Chautauqua Lake and Goose Creek. In recent years, an increase in year-round residents helped make significant improvements in the existing homes. The Town of Busti plans further improvements in the park by adding a .64 mile paved walking track. Vukote, the area east of the park, which was originally conceived as a small fishing community for summer visitors, is a lakeside subdivision with canals. Not only are these areas benefited by their location on the lake along with creek and canal access, but also by the location of the Edward F. Loomis, Jr. Park. Please contact Town Clerk office at 716-763-8561 to reserve the pavilion.